Silver stunner: Cellophane Disco 02 super silver mirrored lenses. The frame is polished silver metal with polished crystal temples. 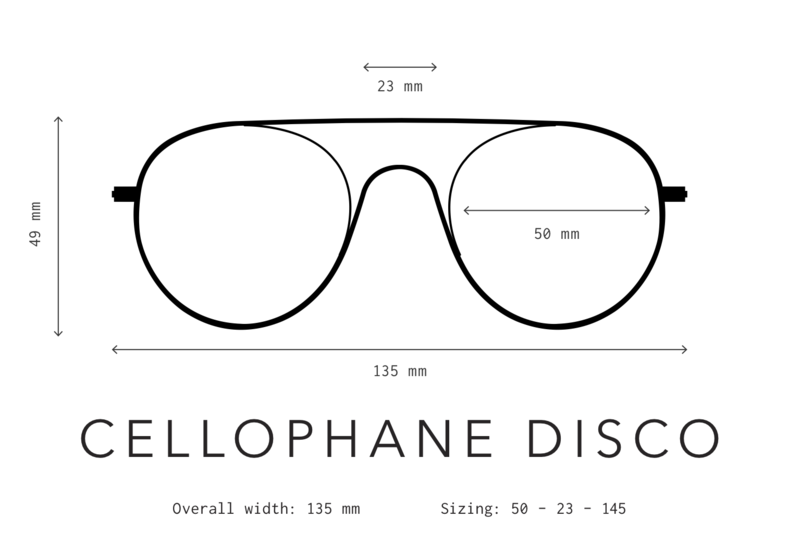 You get all of comfort and adjustability of acetate temples, with a look as though nothing is there. The silver ceramic nose pads are hypoallergenic, and polished super silver metal side inlays complete the look. Go glam: Cellophane Disco is fun, lightweight frame featuring ultra-flat lenses, constructed using only the finest materials and best craftsmanship. Each frame is meticulously handmade in Japan and features high-quality shatterproof lenses with 100% UV protection. The shape was designed to be flattering on all faces. Its super-durable surgical stainless-steel construction and smooth, high-quality hinges ensure these will be your favorite shades for years to come. Like reliving a scene from the dance floor of Studio 54, Cellophane Disco was inspired by the vintage fashion and music of the 1970's. Its retro round lenses are reminiscent of the hippie styles of the time, while its technologically advanced frame construction brings it into the 21st century.